Before playing each game, perform the following steps in order. The setup diagram on page 5 shows an example of these steps. Unfold the game board and place it in the center of the play area within easy reach of all players. A. Create the Gate stack by randomizing the nine Gate tokens, and placing them facedown (common side up) in a stack within reach of all players. B. Create the Clue pool by placing the Clue tokens facedown (common side up) in a pile within reach of all players and randomize them. 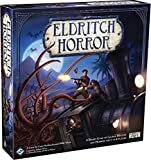 C. Create the general token pool by taking all Health, Sanity, Improvement, Travel Ticket, Eldritch, Mystery, and Rumor tokens and place them in piles within reach of all players. Players agree upon one player to receive the Lead Investigator token. If they cannot decide, players assign this token to a random player as they see fit (for example, by rolling a die). Starting with the Lead Investigator and proceeding clockwise, each player chooses one investigator. He takes the corresponding Investigator sheet, then places the matching Investigator token on the game board space listed on the back of his Investigator sheet. Each investigator receives the starting possessions listed on the back of his Investigator sheet (see image above). He gains any Assets or Spells listed by taking the matching card from the game box. Then he takes a number of Health and Sanity tokens equal to his investigator's maximum Health and Sanity listed on the front of his Investigator sheet. He places these tokens near his Investigator sheet. As a group, players choose one of the Ancient One sheets. Each Ancient One provides a different game experience. For their first game, it is recommended players choose Azathoth, as he is the most straightforward Ancient One. Place the chosen sheet faceup (displaying a Doom value in the top left corner) near the game board and resolve any setup effects on the sheet. Take all non-epic Monster tokens and place them in an opaque container such as a bowl, mug, or the cover of the game box. Then shake this container to randomize the Monster tokens. Do not place the Epic Monster tokens in the Monster cup. Epic Monster tokens are marked by their red color and clipped lower-left corner. 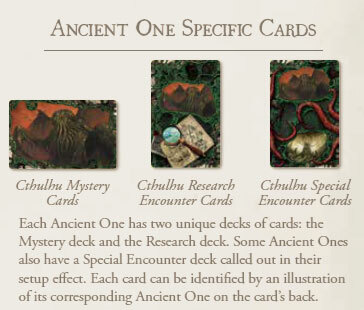 Take all Research Encounter cards, Special Encounter cards, and Mystery cards that do not correspond to the chosen Ancient One and return them to the game box. Those cards will not be used for this game. Then separate all other cards as listed below and place them near the game board. Shuffle all Expedition Encounter cards into a single deck, regardless of card back. Shuffle the Spell cards and Condition cards into two separate decks. Place these decks faceup, with the top card's name and artwork visible. Set the Mythos cards aside for step 8. Then separate all other cards into decks by card back and shuffle each deck. 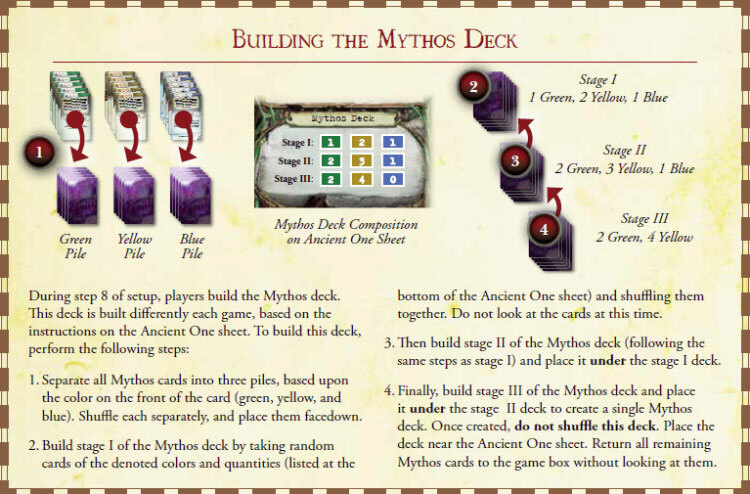 Follow the instructions at the bottom of the Ancient One sheet to build the Mythos deck. A. Place the Reference card that corresponds to the number of players near the Mythos deck. Players use the Reference card when resolving Mythos effects. Return all other Reference cards to the game box. B. Place the Doom token on the space of the Doom track listed on the upper-left corner of the Ancient One sheet. 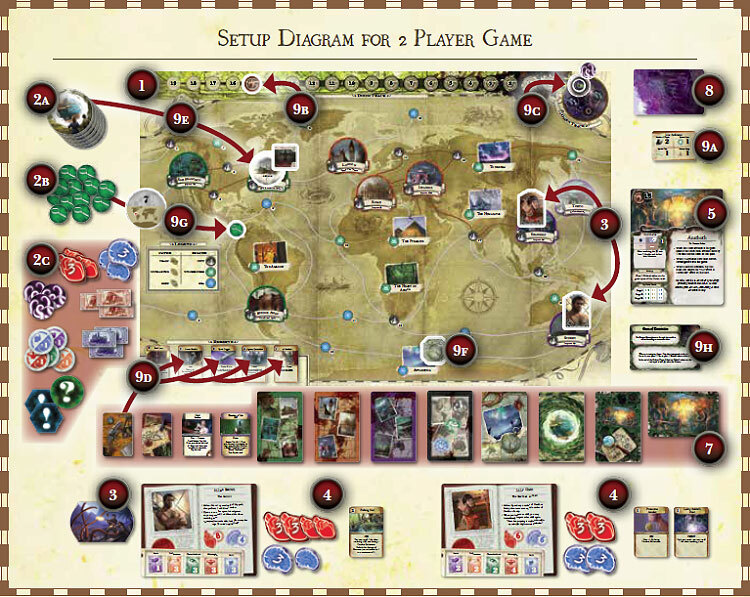 For example, the Azathoth sheet denotes that the Doom token starts on the 15 space of the Doom track. D. Place the top four cards of the Asset deck faceup in the four slots of the reserve (at the bottom-left of the game board). E. Spawn the number of Gates indicated on the Reference card. To spawn a Gate, take the top Gate token from the Gate stack and place it faceup on the space indicated on the Gate token. Then draw one random Monster token from the Monster cup and place it on the same space. F. Place the Active Expedition token on the space that corresponds to the illustration on the back of the top card of the Expedition Encounter deck. G. S pawn the number of Clues indicated on the Reference card. To spawn a Clue, take one random Clue token from the Clue pool and place it facedown on the space indicated on the face of the Clue token. H. Finally, draw one Mystery card and place it near the Ancient One sheet. Then resolve any When this card enters play effects on that card. 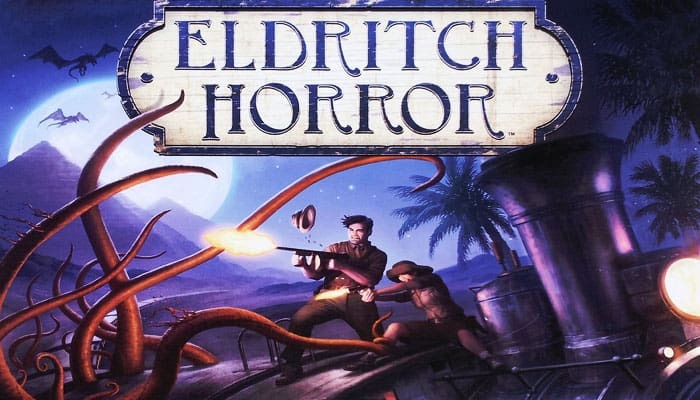 Eldritch Horror is a cooperative game. All players are on the same team and win or lose the game together. The investigators' ultimate goal is to banish the Ancient One from this world by solving Mysteries. In addition, investigators need to deal with many threats and crises facing the world. These appear in the form of Gates (which spawn Monsters and can awaken the Ancient One) and Rumor Mythos cards (which harm investigators and can end the game prematurely). Action Phase: Investigators perform actions to move about the game board and prepare for the tasks ahead. Encounter Phase: Investigators fight Monsters or resolve encounter cards on their current space. Mythos Phase: The Lead Investigator resolves one Mythos card. These cards often advance the Doom token, spawn Gates, or raise other challenges that investigators will need to overcome. At the end of each Mythos Phase, the Lead Investigator may pass the Lead Investigator token to any player of his choice. Investigators then start a new game round beginning with the Action Phase. Players continue resolving game rounds until they have won or lost the game. During this phase, each investigator resolves up to two actions. 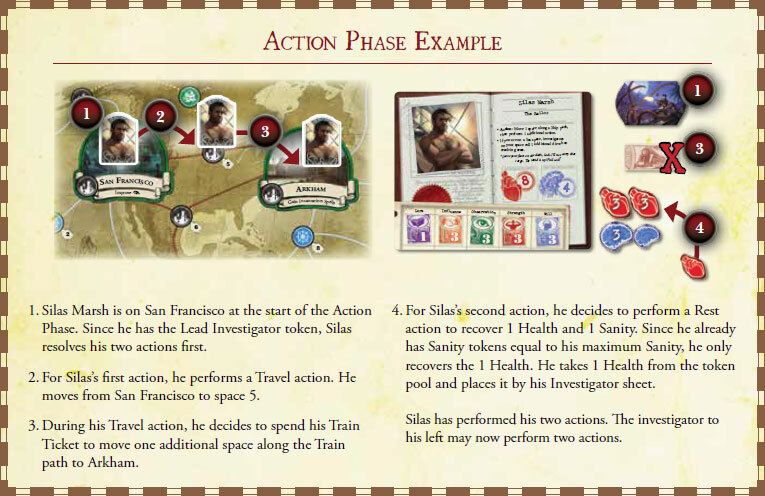 Performing actions is the main way in which investigators move about the game board and acquire beneficial cards and tokens (such as Asset cards and travel tickets). This phase starts with the Lead Investigator. He performs two actions of his choice, then the investigator to his left performs two actions, and so on, until each investigator has performed his actions. Important: Each investigator can perform each action only once during a round. For example, an investigator cannot perform two Rest actions. The investigator moves his Investigator token to any adjacent space (see What are Spaces and Paths? on the right). After moving, the investigator may spend any number of travel tickets to move one additional space per ticket spent. Investigators can only spend Train Tickets to move along Train paths, and Ship Tickets to move along Ship paths (see What are Spaces and Paths? on right). The investigator recovers 1 Health and 1 Sanity. An investigator cannot perform this action if there is a Monster on his space. What are Spaces and Paths? The different types of spaces and paths are shown on the Legend on the game board. Tokens are often placed on spaces of the game board. Spaces include named locations (such as Arkham), as well as numbered locations. Each space is connected to at least one adjacent space by lines known as paths. The investigator may trade possessions (Assets, Artifacts, Clues, Spells, and travel tickets) with another investigator on his space. If the investigator is on a City space, he gains one travel ticket of his choice. The investigator cannot gain a Train Ticket unless there is at least one Train path connected to his space. Likewise, he cannot gain a Ship Ticket unless there is at least one Ship path connected to his space. If a player ever has more than two travel tickets, he must choose two to keep and discard the rest. 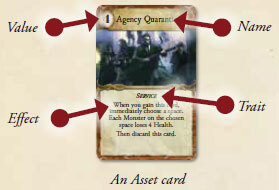 If the investigator is on a City space, he may attempt to acquire Asset cards from the reserve. He tests his Influence ( ) by rolling dice and gains Assets of his choice from the reserve with total value equal to or less than the number of successes rolled. If he does not gain any cards, the investigator may discard one card of his choice from the reserve. After performing an Acquire Assets action, replace any cards discarded or gained from the reserve by drawing replacement cards from the Asset deck. An investigator cannot perform this action if there is a Monster on his space. The investigator may perform an action listed on one of his components (such as a card or his Investigator sheet). These actions are preceded by the word Action in bold. Although an investigator cannot perform a component action from a single component more than once each round, he can perform component actions of different components. 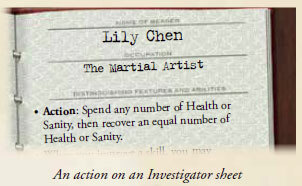 Example: Lily Chen uses the action ability printed on her Investigator sheet. Then, for her second action, she could perform an action printed on an Asset card she has. An investigator may also perform some actions using components held by other investigators on his space. These actions are preceded by the phrase Local Action in bold. During this phase, each investigator resolves one encounter. Encounters often involve reading a short narrative on an encounter card which can have positive and/or negative effects. This phase starts with the Lead Investigator. He resolves an encounter, then the investigator to his left resolves an encounter, and so on, until each investigator has resolved one encounter. During the Encounter Phase, if an investigator is on a space containing one or more Monsters, he must resolve a single Combat Encounter against each Monster on that space, one at a time, in the order of his choice. If there are zero Monsters on an investigator's space, he instead resolves a location encounter or a token encounter of his choice as described in the sections below. If an investigator is on a space containing one or more Monsters, he must resolve a single Combat Encounter against each Monster on that space, one at a time, in the order of his choice. After an investigator resolves all Combat Encounters, if there are no Monsters in his space, he may resolve another encounter. The investigator draws an encounter card matching his space's artwork or from the General Encounter deck. He resolves the effect that matches his current space, then discards the card. If an investigator has multiple types of encounter cards that he could draw, he chooses which deck to draw from. Example: An investigator is on Arkham. He can choose to draw a card from either the General Encounter deck or the America Encounter deck. If he chooses to draw a General Encounter card, he then resolves the City portion of the card. The text below each named space on the game board lists the most common effect found on its specific encounter cards. 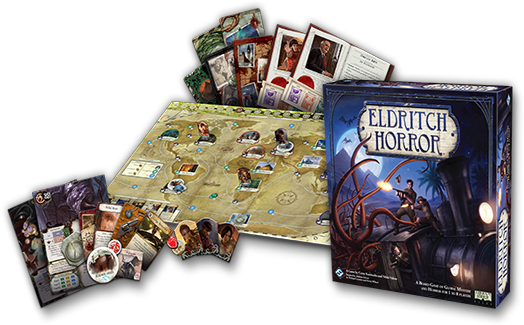 Some tokens are placed on spaces of the game board and provide additional encounter options for investigators on that space. Clue tokens allow investigators to draw and resolve Research Encounter cards. Gate tokens allow investigators to draw and resolve Other World Encounter cards. The Active Expedition token allows investigators to draw and resolve Expedition Encounter cards. Rumor tokens allow investigators to resolve the encounter listed on the Rumor Mythos card that refers to that space. Defeated Investigator tokens allow investigators to resolve the encounter listed on the back of the defeated investigator's sheet. Resolve all effects proceeded by a @ icon on components in play. These components are marked with a red reckoning icon in the lower-right corner as a visual reminder. 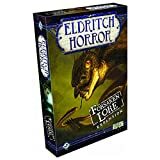 Resolve these effects in the following order: Monsters, Ancient One sheet, Ongoing Mythos cards, and lastly investigator possessions and Conditions. Spawn a number of Gates as defined by the Reference card. At each gate that matches the Omen token's current space, spawn the number of Monsters listed on the Reference card. If there are no matching Gates currently on the game board, spawn one Gate instead. Spawn a number of Clues as defined by the Reference card. Place a Rumor token on the space listed. Place the listed number of Eldritch tokens on this Mythos card. If the card has the Event trait listed above the text effect, immediately resolve the effect and then discard the card. If it has the Ongoing trait, place it in play near the Ancient One sheet. It remains in play until discarded by a game effect. Investigators resolve only the effects displayed on the current Mythos card. 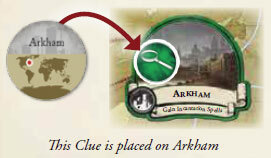 For example, if the Mythos card does not have the spawn clues icon, investigators do not resolve the spawn clues step. 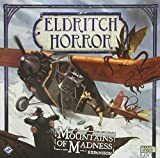 What are the Doom and Omen Tracks? The Doom track measures the time remaining until the Ancient One awakens. When Doom advances, move the Doom token toward the 0 space of the Doom track. When Doom retreats, move the Doom token away from the 0 space of the Doom track. The Omen track's purpose is to advance Doom. When the Omen token advances, investigators advance Doom by 1 for each Gate on the game board that matches the current Omen symbol. When an effect spawns a Gate, take the top Gate token from the Gate stack and place it faceup on the space indicated on the Gate token. When a Gate is spawned, a Monster is spawned on the same space. Gate tokens represent tears in the fabric of reality. These gateways can lead to other worlds, dimensions, or even points in time. These dangerous anomalies allow deadly powers into our world, such as Monsters and eventually even the Ancient Ones. Gates are the main way that Doom advances (see the Advance Omen step of the Mythos Phase). To prevent Doom from advancing (and the Ancient One from awakening), investigators need to resolve Other World Encounter cards to close (discard) Gates. When an effect spawns a Monster, draw one random Monster token from the Monster cup and place it on the space indicated by the effect. If the Monster has the spawn icon, look at the back of the Monster token and resolve its effect immediately after spawning it (for example, When this Monster is spawned, move it to Heart of Africa). What is the Monster Cup? During setup, players choose any opaque container, such as the game box lid, to serve as the Monster cup. When a Monster is spawned, one player draws a random Monster token from the Monster cup without looking. When a Monster is defeated or discarded, return it to the Monster cup. Then shake the container to randomize the Monster tokens. When an effect spawns a Clue, take one random Clue token from the Clue pool and place it facedown on the space indicated on the Clue token. Clue tokens represent secrets and lore about the Ancient One. Investigators can collect these tokens by resolving Research Encounters. Investigators use Clues to solve Mysteries, solve Rumors, and to reroll dice during tests. Investigators immediately win the game if they solve three of the Ancient One's Mysteries. If the Ancient One awakens, investigators will also need to solve the Final Mystery in order to win the game. If the Doom token reaches the 0 space of the Doom track, the Ancient One awakens. The back of the Ancient One sheet lists how investigators can lose the game. All investigators have been eliminated from the game. A card effect causes investigators to lose the game. This most frequently appears on some Rumor Mythos cards. The investigators are required to draw a Mythos card but cannot because the Mythos deck is empty.